Currently, Su Yi also did not want to attack this Green Jade Python, but he was quite interested in the White Jade Fungi. If he were to find the White Jade Fungi and nurture it within his mysterious space, its price may rise to be even higher. The Green Jade Python continued staring at Su Yi with a ferocious gaze. Su Yi said. He knew that this Green Jade Python had a certain level of intelligence, enough to understand his words. But as Su Yi finished his words, bloodlust crossed the python’s eyes. Its body which was coiled around the towering tree lashed out like lightning at Su Yi. Its body gave off a cold and intimidating aura as it opened its hideous jaw to try and swallow Su Yi whole in a single gulp. It was also at this moment, a tyrannical and destructive aura burst out from within Su Yi, his tattered clothes fluttered with the movement of the aura. The body of the Green Jade Python that had lashed out like lightning, retreated promptly back to the tree in the blink of an eye. Its once ferocious eyes brimmed with shock and fear as it felt Su Yi’s aura, trembling as it looked upon Su Yi confused. Looking at Su Yi, the body of the Green Jade Python which was more than a dozen meters long slowly slithered down and laid on the ground in front of Su Yi as if it was prostrating itself before an emperor. “Bring me to find the White Jade Fungi!” Su Yi said once again as the aura from the “Supreme Chaotic Yuan Technique” gradually flowed off his body like a coat. The python nodded his head, its eyes no longer filled with hostility and it signaled Su Yi to follow. Not long after, close to where Su Yi was, there was a tree so large that it would need more than ten people just to hug the tree, and a crack covered by green vines. The python slithered into the crack of the tree. Su Yi raised his head. The tree was so tall that it stretched into the clouds, branches all spread out so wide that it gave a feeling that it was covering half the sky. Within the crack, there was a large space, bigger than even some small caves. Su Yi was in awe. The leaves of this tree were so dense and green, brimming with life, yet there existed a giant space within the tree, how could one not be astonished by this marvel of nature? Within a crack on the ground, there was a handful of fungi, pure white like jade and painted with vein-like markings. It gave off a medicinal fragrance, filling the entire “cave” with a comforting and pleasant aroma. Su Yi beamed with happiness. This was the highly valued White Jade Fungi which had much importance when making medicine and elixirs. What made Su Yi shocked was that there was not only one White Jade Fungi, but a bunch of them. This bunch of White Jade Fungi had a total of nine stalks, all of which were different sizes. There were fungi the size of a palm and those as small as a baby’s fist. White Jade Fungi existed with Green Jade Pythons for most of their lives. Rumors had it that for Green Jade Pythons to lay eggs, they had to first consume White Jade Fungi to bear the next generation of offspring. Su Yi told the python. Anyhow, the White Jade Fungi belonged to the Green Jade Python, when doing anything, one must not cross the line, half of the White Jade Fungi was already enough for him. Su Yi bent down and carefully picked up five stalks of the White Jade Fungi. He needed them to be in perfect condition since he wanted to transplant them into his mysterious space. Afterward, Su Yi stood up satisfied. This could be considered a windfall. Suddenly, Su Yi frowned. With his above average senses, he felt someone coming near. Within the Forest of Demons, at any time and anyplace, Su Yi had not let his guard down even once. Outside the mouth of the “cave”, three figures appeared and blocked it. They were three men, dressed in tight clothes and around thirty years old. Their faces were slightly tanned and yellow, a sign of all year round beating by the sun and the wind, but it only served to add to their savage appearance. The man which was standing in the center looked older, his figure lean and his hand brandishing a large sabresaber, decorated with several sharp and white teeth of beasts. As soon as the man stopped speaking, Su Yi walked out from the vines. Seeing Su Yi which had suddenly appeared, the faces of the three men changed greatly. But once they saw Su Yi’s rugged look and young age, their eyes looked at him with no hint of worry. Su Yi looked at the three men in front of him, detecting the aura of the men, his face darkened slightly. No wonder the Green Jade Python was injured, it was these three which attacked it and then let it escape so as to find its nest and their target was also the White Jade Fungi. “I said, you guys can leave now.” Su Yi kept the White Jade Fungi and stared at the three men in front of him. 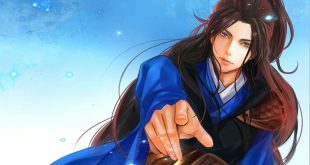 The leader seems to be the one in the middle, Su Yi could feel that the leader was probably of Yuan Xuan Realm First Grade, but he was definitely not more than Second Grade since his aura was not as strong as the Young Master from Black Fiend School. As for the other two, they were both at the Peak of the Yuan Soul Realm Ninth Grade, just that they have not broken through to the Yuan Xuan Realm. These three men which their level of cultivation, seems to have originated from some small adventurer party, though Su Yi did not care much at the moment. Within the Forest of Demon, there were many adventurer parties like the one they belonged to. Hearing Su Yi’s words, the three men were stunned yet again. Judging from his looks, this immature young punk was in a pathetic state, yet he still dared to say something like that to them? “Kid, you do not seem to have even broken off from drinking your mother’s milk, a newborn calf fears not a tiger. It looks like I will have to teach you a lesson today!” The leader smirked coldly, a cold light flashed in his eyes. This brat had succeeded in taunting him, in a place like the Forest of Demons, killing people was far too common. Su Yi smiled slightly, with a hint of mockery. Anyways he was currently trying to train, and just nice these people could be his sparring partners. He had just reached Yuan Soul Realm Sixth Grade and he wanted to test his current strength. “Kid, you really are courting death!” Coldly smiling, bloodlust swirled in the eyes of the man which spoke. Su Yi raised his eyes, within the depths of his black iris, the same bloodlust was flowing as well. The law of the world was one that the strong rules, furthermore since he was in the Forest of Demons, he had to do what other people do. You know what they say: When in Rome, do as the Romans do. As soon as the leader finished speaking, the man beside him could not hold back any longer. He had no weapons, his body was big and brawny, and he wore gauntlets made from fine metal. The brawny man leaped off the ground, Yuan Qi flowed from him and he directed an explosive punch straight at Su Yi. Feeling the aura of Su Yi and seeing his age, the man did not even take Su Yi seriously.